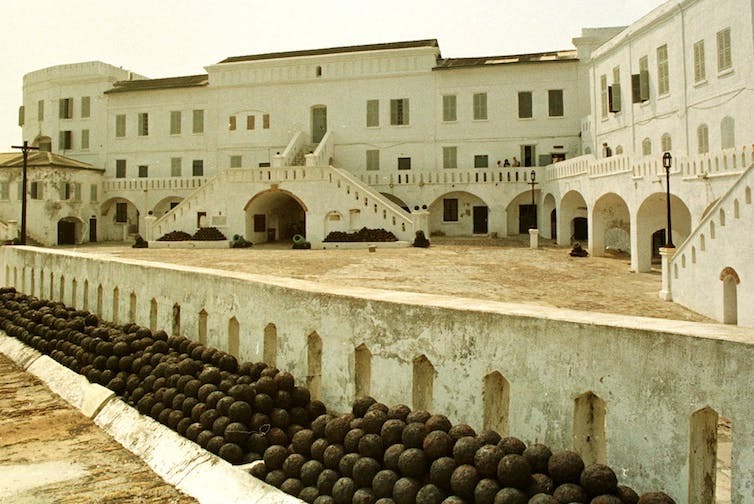 A slave fortress in Cape Coast, Ghana. Between 1500 and 1866, slave traders forced 12.5 million Africans aboard transatlantic slave vessels. Before 1820, four enslaved Africans crossed the Atlantic for every European, making Africa the demographic wellspring for the repopulation of the Americas after Columbus’ voyages. The slave trade pulled virtually every port that faced the Atlantic Ocean – from Copenhagen to Cape Town and Boston to Buenos Aires – into its orbit. To document this enormous trade – the largest forced oceanic migration in human history – our team launched Voyages: The Trans-Atlantic Slave Trade Database, a freely available online resource that lets visitors search through and analyze information on nearly 36,000 slave voyages that occurred between 1514 and 1866. Inspired by the remarkable public response, we recently developed an animation feature that helps bring into clearer focus the horrifying scale and duration of the trade. The site also recently implemented a system for visitors to contribute new data. In the last year alone we have added more than a thousand new voyages and revised details on many others. The data have revolutionized scholarship on the slave trade and provided the foundation for new insights into how enslaved people experienced and resisted their captivity. They have also further underscored the distinctive transatlantic connections that the trade fostered. Records of unique slave voyages lie at the heart of the project. Clicking on individual voyages listed in the site opens their profiles, which comprise more than 70 distinct fields that collectively help tell that voyage’s story. From which port did the voyage begin? To which places in Africa did it go? How many enslaved people perished during the Middle Passage? And where did those enslaved Africans end the oceanic portion of their enslavement and begin their lives as slaves in the Americas? Given the size and complexity of the slave trade, combining the sources that document slave ships’ activities into a single database has presented numerous challenges. Records are written in numerous languages and maintained in archives, libraries and private collections located in dozens of countries. Many of these are developing nations that lack the financial resources to invest in sustained systems of document preservation. Even when they are relatively easy to access, documents on slave voyages provide uneven information. Ship logs comprehensively describe places of travel and list the numbers of enslaved people purchased and the captain and crew. By contrast, port-entry records in newspapers might merely produce the name of the vessel and the number of captives who survived the Middle Passage. These varied sources can be hard to reconcile. The numbers of slaves loaded or removed from a particular vessel might vary widely. Or perhaps a vessel carried registration papers that aimed to mask its actual origins, especially after the legal abolition of the trade in 1808. Compiling these data in a way that does justice to their complexity, while still keeping the site user-friendly, has remained an ongoing concern. 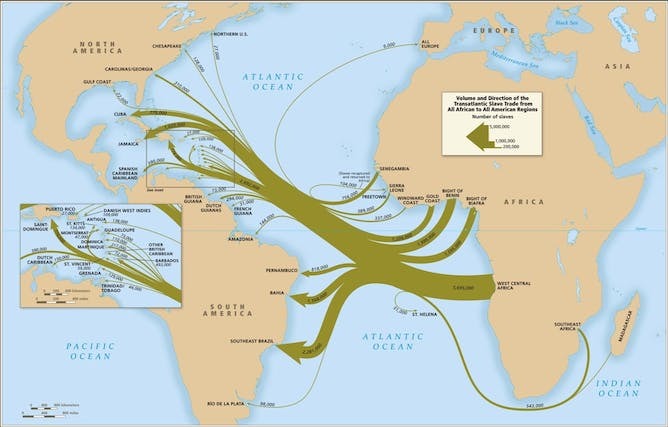 Volume and direction of the transatlantic slave trade from all African to all American regions. Of course, not all slave voyages left surviving records. Gaps will consequently remain in coverage, even if they continue to narrow. Perhaps three out of every four slaving voyages are now documented in the database. Aiming to account for missing data, a separate assessment tool enables users to gain a clear understanding of the volume and structure of the slave trade and consider how it changed over time and across space. While gathering data on the slave trade is not new, using these data to compile comprehensive databases for the public has become feasible only in the internet age. Digital projects make it possible to reach a much larger audience with more diverse interests. We often hear from teachers and students who use the site in the classroom, from scholars whose research draws on material in the database and from individuals who consult the project to better understand their heritage. Through a contribute function, site visitors can also submit new material on transatlantic slave voyages and help us identify errors in the data. The real strength of the project – and of digital history more generally – is that it encourages visitors to interact with sources and materials that they might not otherwise be able to access. That turns users into historians, allowing them to contextualize a single slave voyage or analyze local, national and Atlantic-wide patterns. How did the survival rate among captives during the Middle Passage change over time? What was the typical ratio of male to female captives? How often did insurrections occur aboard slave ships? From which African port did most enslaved people sent to, say, Virginia originate? H.M.S. 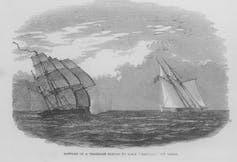 ‘Rattler’ captures the slaver ‘Andorinha’ in August 1849. Scholars have used Voyages to address these and many other questions and have in the process transformed our understanding of just about every aspect of the slave trade. We learned that shipboard revolts occurred most often among slaves who came from regions in Africa that supplied comparatively few slaves. Ports tended to send slave vessels to the same African regions in search of enslaved people and dispatch them to familiar places for sale in the Americas. Indeed, slave voyages followed a seasonal pattern that was conditioned at least in part by agricultural cycles on both sides of the Atlantic Ocean. The slave trade was both highly structured and carefully organized. The website also continues to collect lesson plans that teachers have created for middle school, high school and college students. In one exercise, students must create a memorial to the captives who experienced the Middle Passage, using the site to inform their thinking. One recent college course situates students in late 18th-century Britain, turning them into collaborators in the abolition campaign who use Voyages to gather critical information on the slave trade’s operations. Voyages has also provided a model for other projects, including a forthcoming database that documents slave ships that operated strictly within the Americas. We also continue to work in parallel with the African Origins database. The project invites users to identify the likely backgrounds of nearly 100,000 Africans liberated from slave vessels based on their indigenous names. By combining those names with information from Voyages on liberated Africans’ ports of origin, the Origins website aims to better understand the homelands from which enslaved people came. Through these endeavors, Voyages has become a digital memorial to the millions of enslaved Africans forcibly pulled into the slave trade and, until recently, nearly erased from the history of not only the trade itself, but also the history of the Atlantic world.